Two views of the dinning room at Little Bohemia. These photos, basic tourist postcards sold at the popular lodge, were taken about the time of the shootout. The room looks as it would have when the gang was there in April of 1934. John Dillinger, known as John or Johnnie by other members of the gang. John Hamilton. Called 'Red' within in gang because of the redish-brown hair. George Nelson. Called George or Jimmie by the others. Homer Van Meter. Called Van within the gang. Thomas Carroll. Called Tommy by the others. As the heat on the gang intensified, they needed a safe place to rest and regroup, so it was no surprise when they began talking about getting away for a "vacation." On the night of April 19, 1934, Nelson, Dillinger, Hamilton, Carroll, Van Meter, and assorted wives and girlfriends were dining in a private room at Louis' Place, a popular Italian restaurant in Fox River Grove, Ill., just outside Chicago. It was owned by Louis Cernocky, who had extensive underworld connections, and often entertained wanted men in a private dining room at the back of his restaurant. Also there was Pat Reilly, a meek, good-natured Irishman from St. Paul, Minn., who served as an errand boy and go-between for various underworld figures. Someone remembered there was a remote lodge in northern Wisconsin, called Little Bohemia, that was all but deserted at that time of year. The gang agreed it would be a perfect place to get out of the headlines, and decided to leave early the next morning on the 400-mile trip. As planned, the gang was on the road shortly after sunrise. They traveled in three cars, leaving several miles distance between each one, standard practice anytime a gang is on the move. Van Meter was in the lead car. With him was his girlfriend, Marie ("Mickey") Conforti, 21, and her pet dog, a Boston terrier puppy named Rex. Reilly was driving. Reilly enjoyed hanging out with gang members and listening to the stories of their exploits. He was within two days of learning firsthand just what their lives were all about. Van Meter arrived at the lodge at about 2 p.m., and as the arrivals ate a late lunch of pork chops and fresh-baked bread, Van Meter asked owner Emil Wanatka and his wife, Nan, if they could put up 10 guests for several days. The group was on its way to Duluth, he said, and wanted some quiet time before getting back to their businesses. Wanatka said there was plenty of room, happy for the unexpected guests during the off season. After lunch, Van Meter strolled around the grounds, telling the Wanatkas he needed to stretch his legs. In truth, he was studying the complex. Behind the building was a steep embankment leading down to Little Star Lake. The embankment, he reasoned, would provide perfect cover in an emergency. Two employees on duty, George Bazo, 26, and Frank Traube, 23, unloaded the luggage from the vehicles. Some of the luggage was exceptionally heavy, and Bazo joked to Wanatka that "This one must be full of lead." Nelson, Carrol, and their wives decided to share a three-room cabin a few yards from the main lodge. It had two bedrooms and a small sitting room. All the others were assigned double rooms on the second floor of the main building. Dillinger and Reilly opted to share a room to save the Wanatkas the trouble of making up two singles. For the rest of the early evening, the guests unpacked and strolled the grounds. The lodge staff didn't find it strange the male guests seemed especially interested in the location of the lodge's windows and doors, and happily answered questions about roads in and out of the area. Mrs. Wanatka prepared a dinner of beef, boiled potatoes, rice, red cabbage and cherry pie for her guests. Later in evening the women went to their rooms, and the men sat in the lodge and talked quietly. A card game was started, and Carroll invited Emil Wanatka to sit in. They played poker and hearts at a large, round table in the bar, but none of the outlaws drank. Carroll and Nelson were talkative and joked with the barkeeper and each other most of the evening. Dillinger, Van Meter (called Wayne while at the lodge) and Hamilton (called Bill) were friendly and polite, but said little. Wanatka was relaxed and having a good time. At first he thought it odd none of the guests had removed their sport coats to relax, until he noticed each was wearing a shoulder holster - and each holster held a gun. As the evening went on, Wanatka noticed a small mole between Dillinger's eyes. Then he remembered that when Dillinger was walking around the lodge, he had a slight shuffle - two things mentioned in a recent description of the wanted robber that he had read in the newspapers. Excusing himself, Wanatka went into the kitchen and quickly searched newspapers for a photo of Dillinger. It wasn't hard to find one. 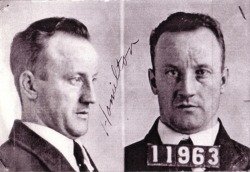 Dillinger's photo, and those of the others, were regularly in the papers. Wanatka realized who his guests were, and he frightened. He returned to the game, but said little the rest of the night. Later, in bed, he told his wife about his discovery.